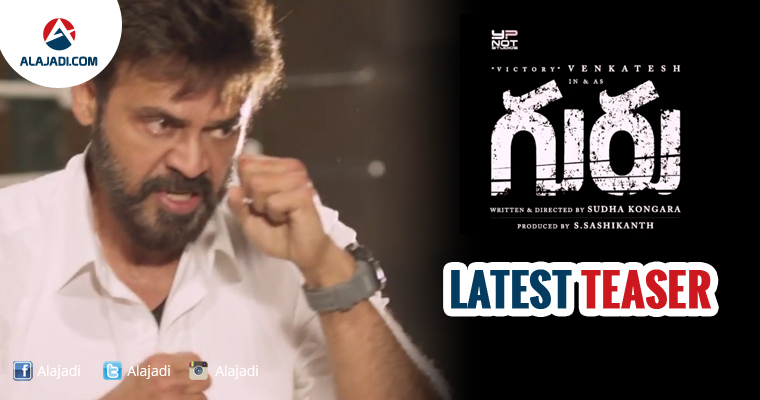 Veteran tollywood actor victory Venkatesh is currently busy with the post production work of his upcoming movie titled Guru. Sudha Kongara who directed the original version of Guru (Irudhi Suttru in Tamil), and (Saala Khadoos in Hindi) is also helming the mega phone for the film as well. Makers have released the latest teaser of Guru few minutes ago which is already going viral through the social networking sites. Venky looks fierce and stunning in the rugged look and suits the role of a defiant boxing coach well. The movie tells the story of a very talented boxer who fails to make career due to the dirty politics in the boxing association. After the 10 years later, he turns a coach for the women’s boxing teams. How he trains a roadside fish seller, Madhi (Ritika Singh), and makes her a champion despite poor infrastructure forms the crux of the story. Both movie versions made an excellent collection at box office. Madhavan and Ritika Singh played the leads role in both the Hindi and Tamil movie versions. Rithika Singh is playing the student of Venky. The shooting was kick-started in September and it was wrapped up recently. The post-production works are on and the flick will hit the screens on 26 January. Santhosh Narayan of Kabali fame is scoring the tunes.